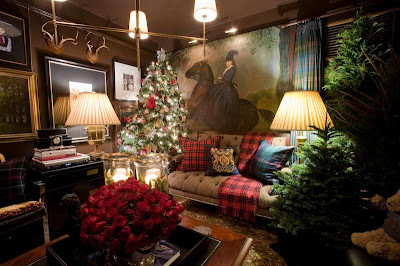 the adventures of tartanscot™: "Tis the Season . . . "
Greetings from the front lines of the Christmas 2009 installation here at the house. I'm curious how many of you out there are spending a goodly portion of your Thanksgiving holiday weekend getting your homes ready for the next holiday? For me, it means a certain amount of planning . . . and time . . . and trips to the flower market. I love being here at the house and playing with ideas . . . making the house celebratory . . . and different from previous years . . . Including early morning trips to the SF Flower Market. Masses of bright, waxy magnolia branches. Kumquat branches, fresh rosemary and silver eucalyptus. And my favourite roses, lilies, and hypernicum berries. So, tonight was all about getting the canopy installed over the dining table (complete with fresh greenery and pheasant feathers (my perennial favourite!)) which involved moving the dining table into the other room. Lol - it's been a long day . . . The plan is to make the dining room magical - and show off my recently acquired antique china. But, here's the progress thus far. All the trees are up - and lit - in the dining room. And the fresh garlands are placed in the chandelier. Getting ready to some serious slumber . . . with visions of wreaths and garlands in my dreams. M21 - glad to have provided inspiration. lol. ***** Wellll, it just COULDN'T be more "excitingly enticing", my friend!!! Ohhhhh YES, you nailed it!!! Thanks mucho for sharing!!! I've got my list of things to do. I usually start with exterior lights going up outside and move inside to complete the celebration feel. Put Christmas music on, light candles and enjoy it all. Great fun, great snaps and you'll be complete in no time. Gorgeous - and it must smell amazing. Mr. B has taken advantage of our warm weather to put up the outside lights, but inside will start next week. Can't wait to see that china. Get out of town!--and come to mine! Everything looks amazing. You ALWAYS do the BEST job. Your interiors are not only beautiful, but welcoming too! Hope your Thanksgiving was fabulous! I've been following your blog for a few weeks now and it's now one of my absolute favorites to check in with. I visited your new website, eager to see more of your work and I must tell you how overwhelmed I was...it is not often that I see rooms that I feel I could move into without a single addition or subtraction. I literally found myself emotionally moved to see the beautiful rooms of Atherton II. And your own gorgeous little jewel box of an apartment is too rich and inviting for words. Your work is the epitome of traditional warmth and comfortable elegance and it inspires me to no end! Gahhh! A pair of perfectly scaled trees flanking that gorgeous sofa! You never cease to amaze me, Scott. Well done. Now could you just get over here and replicate that at my house? BTW, if you ever tire of your stunning art, I'd gladly take it off your hands. thanks for all the sweet feedback . . . it's clearly one of my favourite things to do . . .
We have all of the outside lights up and went to cut our tree up in the Sierras last Sunday. Now you have me inspired to get going inside! Beautiful! I feel like I am in a Dickens story. Smiling and sighing now.